Arnaldur Indriðason’s Hypothermia was the first Icelandic crime novel I ever picked up and read. I can’t remember exactly when that was but it feels like an awfully long time ago now and it's hard to believe that this is the eleventh book in his Reykjavík Murder Mysteries series. The eleventh translated into English anyway. When he first started writing crime fiction in the late 90s many people here in Iceland laughed at him as it had never really been done before and wasn’t taken at all seriously by the literary crowd on this little island. In 2003, he had five novels on the Icelandic best-sellers list for a week and is the only author other than J.K. Rowling to simultaneously hold the top three spots. In 2004, his books were seven of the 10 most popular titles borrowed in Reykjavík City Library. He single-handedly launched Icelandic crime fiction as a legitimate international entity and since then it has not only joined the ranks of its Scandinavian counterparts but in many ways overtaken them with the hugely successful Yrsa Sigurðardóttir and the much more recent phenomenon Ragnar Jónasson. 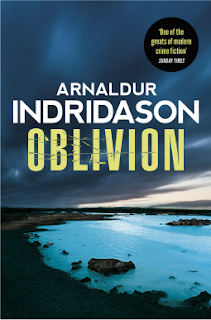 Other Icelandic crime writers to have been translated into English include Viktor Arnar Ingólfsson and Árni Þórarinsson who I am sure will be joined by the likes of Sólveig Pálsdóttir and Lilja Sigurðardóttir (no relation to Yrsa) in the not too distant future, such is the depth of talent here now. In Oblivion we are once again heading back in time as we did in Reykjavík Nights. It’s 1979 and Erlendur and Marion Briem, his mysteriously genderless boss, are investigating the discovery of a body found sunken in a remote milky-blue pond that sounds suspiciously like the predecessor of today’s internationally famous ‘Blue Lagoon’ spa. The unlucky chap didn’t drown in the warm run-off water from the nearby Svartsengi power station though but rather died elsewhere after a fall from a great height before being dumped in the blue soup in an awkward attempt to hide his body from the world. And if it hadn’t been for an imaginative psoriasis sufferer trying to relieve her itching arms he might just have stayed there until the recent tourist boom when he would have been charged retrospectively for all those hours spent lolling about at their precious resort. He is soon identified as one of the local contractors who work at the American Naval Air Station at Miðnesheiði where he had access to the enormous Hangar 885 that was designed to be large enough to hold even the mighty B-36 bombers.Iceland’s relationship with their American ‘friends’ is strained at the best of times and this really puts their ability to work together to the test. A number of conspiracy theories emerge as motives for the murder involving America’s intelligence agencies, illegal movement of weapons, nuclear deterrents and an airbase in Greenland. Hangar 885 seems to be the most exciting and dangerous place in the whole country and with the help of an outsider on the inside Erlendur and Marion are determined to get to the bottom of it all. As if he doesn’t already have enough to do Erlendur is also obsessed with a cold case that dates back to the days of the American barracks on the site of the modern day Vesturbæjarlaug swimming pools. Once the Americans abandoned the barracks they became ghetto housing for impoverished locals known as Camp Knox (Kamp Knox was the original title of the book). When he’s not chasing shadows at the secretive air-base he’s reopening old wounds with questions about the disappearance of Dagbjört on her way to school past Camp Knox one day. There’s a creepy connection reminiscent of a scene in ‘American Beauty’ with her oddball neighbour Rasmus but no real leads of any sort to go on apart from an alleged boyfriend from the ‘Camp’. This doesn’t deter Erlendur in the slightest because he’s not the sort of guy who gives up on anything. Elsewhere in the country two men are lost in a blizzard bringing back painful memories of Erlendur’s childhood for him. A theme that is revisited in the later books and which plays a central role in the detective’s psyche. 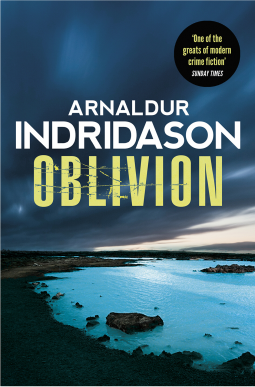 Indriðason’s writing is short and clipped in the same way that Ellroy’s is but without the alliteration and epoch-defining colloquialisms. It’s simple, sometimes disarmingly so, and that is why it works so well. Good crime fiction needs straightforward ideas and short sentences. There are very few writers in this genre who deliver such consistent quality as this guy does and this book is no exception. I used to read his books so that I would learn something about Iceland until the day came when I would finally make the place my home. I’m living here now and I’m still learning about the history of the place from him. Just another reason why I love this guy’s books so much. Grant Nicol is a New Zealand crime writer living in Reykjavik, Iceland. Again, thanks for alerting me to the new title.